Hilaire Belloc (1870—1953) is a writer of light verse who, although he was born in France and served briefly in the French military, spent his life in Britain. His family moved to England when he was just two years old, he attended Balliol College in Oxford, and by 1906 was elected to the British House of Commons. He was a prolific writer of fiction, history, biography, and religion, but is best known today for his poetry. Although he wrote humorous rhymes, there was often a seriousness to be found within, such as in the following brief poem. And all at once were Juliet. 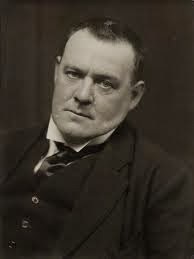 Belloc is author of two books of poetry, Verses and Sonnets, and A Bad Child's Book of Beasts, both published in 1896 — the latter of which satirized moralistic poetry for children. He was a very devout Catholic and influenced his good friend G.K. Chesterton to convert. That the Grace of God is in Courtesy. And Courtesy was in them all. Of God that was Our Lady's Son. He shone with Heavenly Courtesy. For Courtesy was in Her Mind. His large intent of Courtesy. My Rhyme is written, my work is done.